Your tooth enamel is not as bright as it used to be. Years of staining foods and beverages have darkened that once white smile. At Aesthetic & Family Dentistry of Washington, your cosmetic dentist, Dr. Yelena Obholz, takes your smile aesthetics as seriously as your rest of your oral health. Among other cosmetic dental treatments, she offers Zoom! In-office teeth whitening and a convenient at-home version. Learn how it all works toward your outstanding smile. While time and wear and tear change tooth color, other lifestyle factors do as well. Richly-pigmented foods and beverages (such as blueberries, tea, coffee, soy sauce and colas) will gradually change the brightest of smiles. That’s because while tooth enamel is very hard, it is also porous and especially susceptible to discoloration as organic matter in its matrix catches chromogens. Chromogens are the molecules responsible for stains. High acid content in foods and beverages soften enamel and allow it to pick up stains easily. Of course, other factors discolor teeth. Smoking and chewing tobacco are frequent stainers, especially as tobacco use is habitual. Also, the nicotine in tobacco mixes with the oxygen we breath, causing the characteristic yellow color of smokers’ teeth. While discoloration from injury, root canal therapy or some prescription medications goes deep into teeth (intrinsic staining), much of staining is extrinsic and can be more easily prevented and whitened. At Aesthetic & Family Dentistry of Washington, Dr. Obholz offers cosmetic dentistry consultations to determine the best way to improve tooth color or repair other aesthetic defects such as chips, crowding, tooth shape and more. 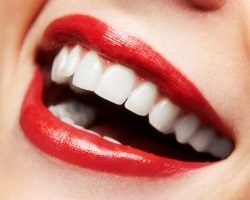 Professional teeth whitening is one of the quickest and most dramatic ways to improve how your smile looks. Dr. Obholz offers Zoom! teeth whitening which brightens tooth enamel in the dental chair in just about an hour. She also offers at-home whitening trays which accomplish a fantastic color change over a week or 2 of daily use. Here’s how Zoom! Whitening works. Dr. Obholz evaluates teeth and gums to ensure they are healthy enough for whitening–that is, no active decay or gum disease. The patient sits comfortably in the dental chair while the hydrogen peroxide gel is applied to tooth surfaces. The gel literally lifts staining material out of tooth enamel as it is activated by a special ultraviolet light. In about an hour, the technician rinses the gel away, and teeth are up to 8 shades brighter. Because the procedure is professionally supervised, patients experience little to no tooth and gum sensitivity. If the patient prefers the in-home whitening option, he or she uses custom-made acrylic trays to place the gel directly on the teeth. This kind of whitening is gradual but just as effective. After applying the gel daily for the number of days specified by the Washington, DC cosmetic dentist, the patient enjoys a super bright smile that lasts with good at-home hygiene and professional cleanings at Aesthetic & Family Dentistry of Washington. It helps to limit staining food and beverages, and of course, smoking cessation benefits oral and systemic health. Additionally, drink plenty of water, and eat fibrous vegetables and fruits to scrub teeth clean. Contact Aesthetic & Family Dentistry of Washington for your teeth whitening consultation. You’ll look and feel great with your dazzling new smile!